WILLEMSTAD – The Inspectorate Department of the Ministry of Economic Development (MEO) was very active last week Friday, May 19. During this inspection round the multi-disciplinary team visited the wholesaler Dricoma which is located at Amerikanenkamp. Here the team found fish, chicken and meats with expiration dates of 2008 to 2013. 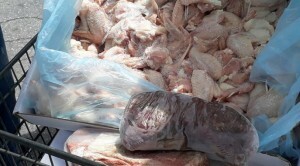 Next to these products, the inspection team also confiscated a pallet full of expired yoghurt (expiration dates of 2013), 22,000 kilos of meats that will have to be inspected by the veterinary services of the government. The team also visited another wholesale store, the EWT at Bombardiersweg. Here they confiscated some cheese products. Seeing that cheese has its special process, a professional of the Public Health Department will continue inspecting these products. Here the team did not find anything else that is past its expiration date. The inspection team also visited a mini market located at Andres Belloweg. The owners were immediately ordered to close down their store. They were not complying with the price regulations of 22 products that are part of the basic food basket. And this is for the fourth time that they have been warned by the authorities. The inspections of MEO and the multi-disciplinary team will continue.